I’m introducing solids to my 7 month old baby this week. He has had nothing but breastmilk to this point (even water!) and I’d say he’s doing pretty well at 22 lbs. and wearing size 18 months. Thad with egg yolk on his face. On Monday I tried acorn squash (or is it an heirloom pumpkin?) which I baked, pureed, and froze in small containers last fall. Tasted pretty good to me, but Baby hated it. At least he just let it hang in his open mouth while drool dripped out. Next day I tried again, with the same reaction. On Wednesday I gave him some veggies from our dinner: zucchini roasted with garlic, sea salt and olive oil. He loved it, even though I only mashed it with my fork. On Saturday morning I tried soft egg yolk, and was surprised again that he loved it. He kept opening his mouth and “diving” for more. Although squash is a fine food to start on, I’m particularly happy about him going for egg yolk, as it is a super-food with excellent nutrients and essential fats, especially for brain development. And since I use duck eggs (because of an allergy I have to chicken eggs) the yolk has B12 in it as well. 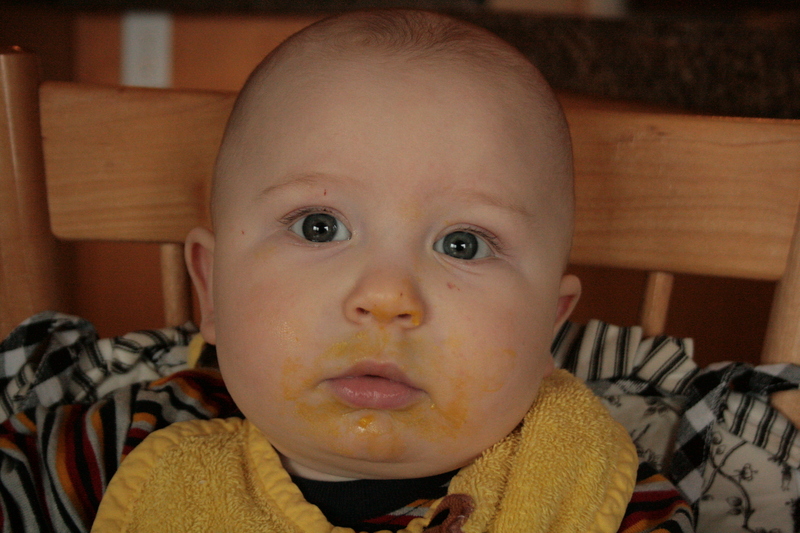 Egg yolk (raw or soft cooked) is the recommended first food for babies in the Nourishing Traditions cookbook. The easiest way to feed soft egg yolk to an infant is to soft boil the egg, then scoop out only the yolk to feed him.